It can be extremely frustrating to plateau on a weight loss journey. You may be doing everything right and the weight just isn’t coming off! One of the largest overlooked culprits to the reason the scale isn’t moving much is stress. Here is the how and why this happens and tips to manage stress. When we are stressed, our bodies produce more cortisol, often known as the stress hormone, causing an imbalance. This is good in the short term (think exercise) but definitely not good in the long term. 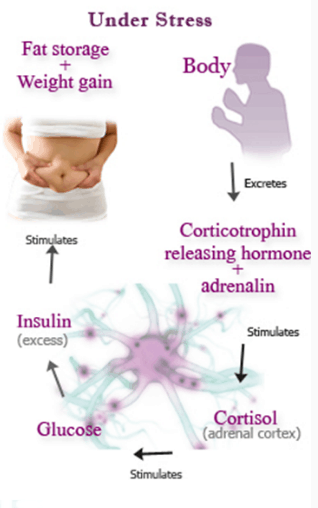 Chronic stress results in a constant increase of cortisol, which can negatively impact our health and wellbeing in several ways including body fat storage. If you find yourself constantly stressed out and believe it may be affecting your weight loss journey, it is beneficial to look for ways to help reduce the stress in your life. This will lead to a healthier, happier, and hopefully skinnier, you! Identify your stressors. From there you will be able to 1. Remove as many as you can from your life and 2. Devise a plan to alleviate the stress from those you can’t avoid. Exercise. Not only does exercise pull your focus away from the daily stress and puts it on the task at hand, it also releases endorphins that help your body and mind recover from the tolls of stress. Limit caffeine. Caffeine does all the things to our body that stress does, making the problem even worse! Slow Down. Make time for yourself every day to relax. Practice yoga, meditate, take a bath, get a massage, etc. Try natural remedies. There are several natural occurring teas, essential oils, and supplements that are proven to aid in relaxation and mood health. Let it out. Journaling and/or confiding in friends or family can help us from getting to caught up in our thoughts. Keep It Simple. Avoid trying to change too much at once. This can lead to more pressure on yourself which could lead to even more stress. Lastly, celebrate the small victories! Weight loss is a journey. There are many life style changes to be proud of, even when the weight might be plateauing due to stress. Did you make it in to see your diet coach this week? Did you drink plenty of water? Did you make smart food choices all week? Did you keep a food journal? These are all things to be proud of it! Don’t let the journey itself stress you out even more!